We are thrilled to announce that our very own Moyna Talcer has received approval on her MSc research project by the University of Ulster’s Research Ethics Committee. Moyna a Highly Specialist Occupational Therapist based in Wallington and a cherished committee member at NAS Sutton is hoping her research uncovers the sensory needs of mothers on the autistic spectrum. 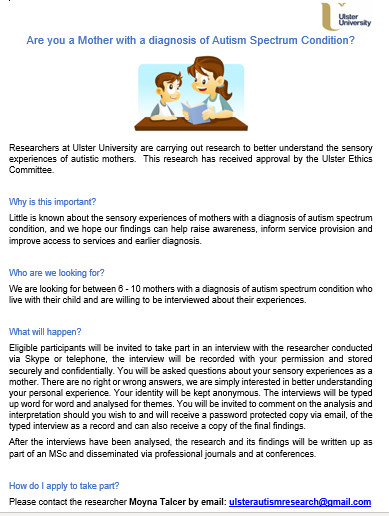 If you are interested in participating in the research project or simply want to know more information about it, please check the below flyer.